GSMArena team, 20 September 2016. Photos is a very easy to use gallery app with support for albums and camera roll, and even recently deleted section, but it has learned a few new tricks, which are quite familiar as they have been on Android for years. The app can now show your photos on a map in a dedicated Places album. You can also opt for a grid of thumbs sorted by location. The app also offers a new People album, where you can find all of your pictures sorted by faces. You can name the albums and explore your moments with a friend of your easily. A cool new iOS 10 feature is the AI sorting in Memories, which scans your photos and sorts them in automatic albums by landmarks, animals, people, topics, and various other criteria. For example, if you go on a wedding, you'll get a new album in the Memories tab with all the pictures you snapped on this event, but not the entire day. Each new Memory gets an automatically created Video Memory, which you can edit anytime. You can add or remove pictures or clips, change the background music and the stitching effects. Photos also creates some cool-looking Memories such as Best of 2015, Best of the Last Three Months, among others. It automatically chooses pictures by people and landmarks, events, among other criteria. And finally, there is an improved search for Photos, which will help you find the right picture from your library very easy - just enter some names, places, months, or similar. Live Images are available, of course, and you can fully enjoy those in the Photos app. The Camera app makes the Live Images stabilized now and you can edit them through the default photo editor - apply effects, crop, rotate, or enhance brightness or contrast. Although not limited to the Photos app, iOS 10 also adds support to wide color DCI-P3 color profile and RAW image support. The wide color support applies to images captured with the front and rear camera of the iPhone 7 (but not videos) as well as images imported to the device using color spaces such as Adobe RGB. The RAW support is in the form of API where third party apps can now capture RAW files, which can be edited on the phone within the Photos app or a compatible third party app. Unfortunately, yet another iOS update doesn't do anything about the video player. You can upload only supported formats via iTunes or purchase videos from the iTunes store. This is an extremely disappointing showing by a platform that is supposed to excel at multimedia consumption. The Music app got a complete UI overhaul and Apple did a great job organizing the feature-rich app. There are now five tabs - Library, For You, Browse, Radio, and Search. The new unified design applies on all of these tabs. You can edit the Library's section if you like. The 'For You' section shows music based on your listening history, likes, as well as the genres and artists you had previous chosen when you first launch the app. Browse helps you make your way through one of the richest song collection in the world. Finally, the Radio tab has the Beats 1 radio, which is available 24/7 and the tracks there are chosen by real DJs, not machine algorithms. There are quite a few other stations available already, including programs created automatically by Apple. This section is available even if you don’t subscribe to Apple Music. The Now Playing screen doesn’t end with what you see on screen. Scrolling up on it reveals a brand new feature and that’s Lyrics (also available in the aforementioned menu button). Apple has added lyrics for some of the tracks, a long requested feature. You can choose to expand this or collapse into a button. Below the lyrics is your up next list along with the stealthily hidden repeat and shuffle buttons. The Music app can do without Apple Music, don't you worry. You just need to add your music collection through iTunes and you are good to go. And while many people are suspicious about the Apple's player, it is a very easy process and they shouldn't be afraid. Apple Music is priced differently in different regions and is accessible from more than 100 countries across the globe. It offers a three month long free trial, after which you have to pay between $2.99 (some Asian markets) and up to £9.99 (UK) depending on where you live. A $14.99/€14.99/€7.99 per month family plan is also available, and this works for up to 6 persons. When plugged into an active external amplifier, the Apple iPhone 7 posted mostly excellent scores, but it's the third iPhone in a row that didn't quite deliver perfect stereo quality. The volume which is just above average doesn't really match the best out there either. 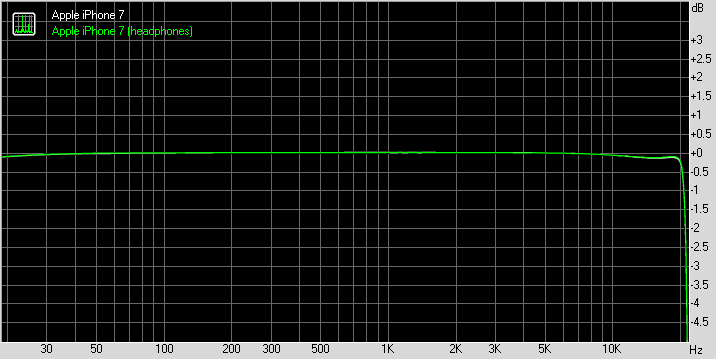 Rather impressively, there's virtually no degradation when you plug in a pair of headphones. The spike in stereo crosstalk is so limited that in comparison, the iPhone 7 fares way better here than in the first test. So the 7, just like the 6s, is a great performer that will please just about every user, but those extremely demanding few have a few better options.